My book Whispers of the Wolf came from traveling to the Four Corners area of the United States, and especially to northern New Mexico. I visited that area two to three times a year for about 10 years, co-leading photography workshops with my friend Dave. I got to know a few families from the Pueblo communities there and was lucky to share a bit of their lives. On one of my earliest trips to the Taos Pueblo, I wandered into one of the small shops off the main plaza. I started chatting with Lupe Romero, who was minding the store. He invited me to sit for awhile. It was winter, so few people were visiting the pueblo that day. Then a large tour bus arrived and dropped off 30–40 people. Well, Lupe decided to play a little joke on one of the tourists and he roped me in to playing along. I won't go into the details, but in the end, the tourist walked away happy and Lupe was grinning from ear to ear the whole time. From then on, Lupe was a good friend. He enjoyed going with Dave and I as we took our small groups around the area. Lupe introduced us to Ted Egri, a sculptor known for sometimes using dynamite in making his art. Lupe had worked with Ted as a welder, helping the artist put together his metal sculptures. Lupe once helped pull our van out of the mud with his truck, when we tried to take a shortcut on a forest road up in the mountains. We were very happy to have him as a friend! I also had friends at the pueblos of San Ildefonso, Santa Clara, Jemez, and Ohkay Owingeh. While the pueblos are the same in some ways (such as the basic way their traditional homes are built), they are also different in many others. For example, each pueblo holds a Feast Day, but the dances may be different. 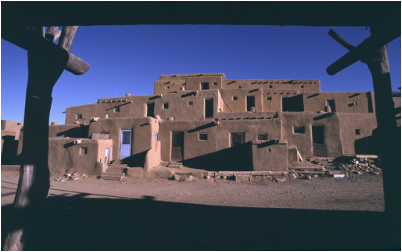 For information about each pueblo of New Mexico, including when their Feast Days occur, this is a good website: www.indianpueblo.org. ﻿﻿Learn more about Feast Days by clicking here or on the image below! Some of the pueblos are known for pottery, others for ceramic storytellers, drums, jewelry, or stone carvings. But not all pueblo members are artists. Just like anywhere else, they hold many types of jobs, including teachers, nurses, machinists, restaurant owners, farmers, etc. They go to school, many to college, serve in the armed forces, have websites, send text messages, and yes, play video games and surf the Internet, too! Thankfully though, perhaps because they have been able to remain in their homelands for many centuries, the special relationship between their culture and the land remains strong and is uniquely reflected in their everyday lives. Ts’o, Pauline. Whispers of the Wolf. illus. by Pauline Ts’o. 40p. Wisdom Tales. Oct. 2015. ISBN 9781937786458. "K-Gr 2–Two Birds is shy and feels isolated from the other boys in his 16th-century Pueblo village. One day, he finds an abandoned wolf pup and decides to rescue and raise it. Through his wolf, he finds his voice as a storyteller and earns the respect and friendship of his peers. Eventually, he must choose whether to keep his wolf in captivity or allow it to run free and pursue its true nature. The stylized pastel illustrations successfully support the emotions of the story and do a particularly nice job of connecting the grandeur of the natural world to Two Birds’s daily life. Ts’o includes notes on each of the illustrations, including information about cultural practices, environmental and historical context, and suggestions for further reading. The story is historical fiction, not a retelling of a traditional story or legend, and although she is not Native herself, the author has made an effort to respectfully tell a story that will resonate with modern-day Pueblos without appropriation. 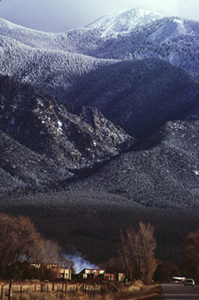 In her foreword, Rosemary Apple Blossom Lonewolf, who is enrolled in the Santa Clara Pueblo (Tewa) tribe, states that “I am happy to declare Whispers of the Wolf a satisfying blend of words and images descriptive of a young Pueblo boy’s life.” The book also includes an approving preface by Vivian Arviso Deloria, an educator enrolled in the Navajo nation. VERDICT With its respectful portrayal of historical Pueblo life and universally appealing animal rescue story, this title is recommended for purchase by most libraries."